Though legally hearing and visually impaired, Whick Turner has been triumphant through the challenges that the Lord has placed before him. Whick was diagnosed with Ushers Syndrome, Type II. This is an inherited condition that causes major hearing loss and a gradual loss of vision that is caused by retinitis pigmentosa. Basically, retinitis pigmentosa is a disease causing the deterioration of the retina behind your eye. Slowly over the years, Whick’s hearing and vision began to deteriorate, but not once did he lose faith in the Lord. Whick has fought long and hard against his disease and has proved to be victorious. Although there were many bumps in the road, he never gave up. I will never forget the day he came and spoke to our class. I could do nothing but sit in amazement as I listened to his positive attitude. Mr. Turner looked at each one of us and assured us that we could do anything we set our minds to because there is nothing impossible with the Lord. Mr. Turner told us everything he has wanted to do has been accomplished, like the writing of his book. 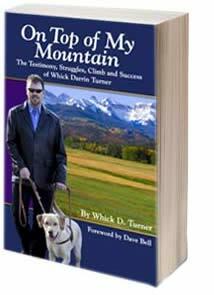 On Top of My Mountain is a collection of his memories throughout his life. All through the book, he reflects about his visual and hearing impairments, how they have slowly affected him, and how no matter what, Jesus has always been influential in his life. Although the Lord has tested him many times, Whick Turner has always stayed true to his faith. Currently he is working as a motivational speaker; Mr. Turner goes to youth detention centers, hospitals, churches, schools, business conventions, and many more places to spread the word of the Lord and to tell his story. He often says the Lord has kept a hand in his life and is always protecting him. I have been inspired by him to become a more positive person and remember to fully rely on the Lord. Whick is “able and not disabled” and has been an inspiration for not only me, but also for countless others. By sharing his experiences of continued hope and his involvements with the Lord, I would have to say that Whick Turner is the most inspiring person I have ever been blessed to know. Designed by Blaser Web Services.